TheTownCrier: Ron Paul? Are you kidding me? Who are you people? Ron Paul? Are you kidding me? Who are you people? One issue voters. Confused, emotional one issue voters. And they come from all stripes of politics. Let's have a look. The Neo nazi groups/conspiracy theorists - Ron says he will end aid to Israel. They've latched on to that one. Most of them don't want the government to function, good or bad because it keeps them in check. Not quite anarchists, but close. The Leftie Anti war crowd, not really pacifists, but bohemian cowards promoting anarchy. Paul says he'll end the war and be nice to everyone no matter how they've tried to kill us. The Conservative who really would like smaller government, as Paul promises. But he closes his eyes to the fact that Ron Paul co sponsored 1000 more bills in a ten year period than Duncan Hunter. Paul never got one of his own bills through in ten years. Hunter managed to get ten of his into law. The Paranoid Constitutionalist. He's frantically grabbing at what he thinks is his last straw, right or wrong, to return to the days of Jefferson and slavery. This guy is smart enough to know we have strayed from 'original intent', but not educated in history or calm enough to understand we have to go back the same way we came, it won't be easy and it won't be quick. Changes like this take time and lots of societal change. I wish it weren't so, but it is. To implement what Paul says he would : new monitory system, the gold standard, no more welfare, no more foreign aid, no more war, no more IRS, etc, would require martial law. Without that, a president can't change those things on his own, they would require action by congress. ( highly unlikely with a congress who doesn't support the nominee since not ONE has given Paul an endorsement). At best you would have complete anarchy. Can you imagine 100 million foreign nationals and citizen bums getting cut off social services at once? Or millions of government employees out of work at once? Does Ron intend to get rid of employment insurance, too? Old People. More than likely. People vote for who they identify with ethnically or 'personally' if you will. Ron Paul is 72 years old. Older than any president when they took office. The Groupies. These are the ones who latch on to anyone who is eccentric and are almost always ill informed. Most of 'em never vote and are young and/or ignorant. They get their news from Comedy skits and sound bites. They don't really care what he stands for, they just like the rallies and noise and the fad. These are the people watching Paul on The Daily Show, Colbert and the like. Mike Reagan says he's invited Paul ten to twenty times as a guest on his show and Paul won't do it. Can't face a conservative or informed audience? Note: Paulites may fall into a combination of these categories, but they all have one thing in common. They're wrong. Many are also very good at insulting and misrepresenting all other candidates and their supporters. 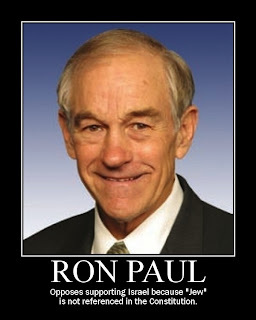 The Paulites have declared war on the rest us, and expect us to raise the white flag like Ron Paul would in Iraq. Not all paranoid constitutionalists are backing Ron Paul. This former Libertarian would like to see Duncan Hunter distinguish himself from the rest of the pack. Similar to what Huckabee pulled off last night. But until he does, he won't gain any traction. Most conservatives that I speak with lean toward Hunter or Tancredo then say, but I'll back Rudy because he's a good administrator.